Enabling the introduction of performance-based procurement, product-service systems (PSS) and output, and functional or performance-based specifications to public procurement in the Western Cape has been identified as an innovative and complementary addition to existing sustainable public procurement (SPP) knowledge and practice. Therefore, this project aims to integrate PSS knowledge into existing public procurement policy and practice in order to drive SPP implementation. In collaboration with WWF South Africa, this project has a strong focus on analyzing and overcoming hurdles for PSS procurement. We will analyze hurdles related to the legal framework, the capacity and skillset of public procurement agencies, the cost of sustainable and performance-based procurement, and the public accounting framework. 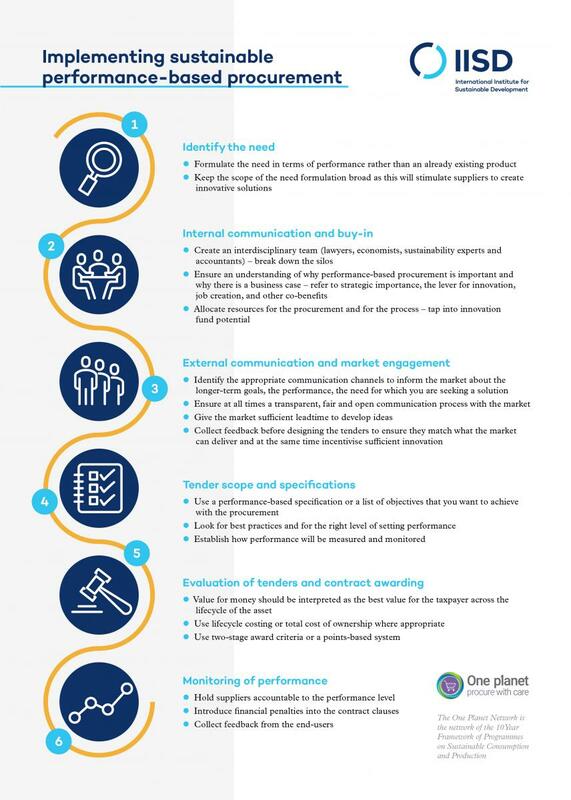 We will propose solutions and identify international and South African best practices that can help identify how public procurement laws, policies and practices have to change to enable the introduction of performance-based procurement. This will result in a guidance document for public procurers and policy-makers in the Western Cape. Overall, the project is designed to directly contribute to the province's and South Africa's green growth and sustainable development goals. It builds upon previous SPP work and initiatives already taking place in the Western Cape and nationally, including an IISD-led project in 2013–14 and joint and separate work of WWF South Africa with the Western Cape government. Previous research by IISD in cooperation with WWF South Africa demonstrates that the legal, institutional and policy frameworks in South Africa and the Western Cape are supportive of SPP but have not been taken fully advantage of. In November 2016 we held a large workshop in Cape Town that raised significant awareness around the need for more SPP with all stakeholders at the municipal and provincial levels of the Western Cape. In March 2018 a large capacity-building workshop will take place in Cape Town. This project is part of the One Planet Network—a network of the 10-Year Framework of Programmes on Sustainable Consumption and Production.